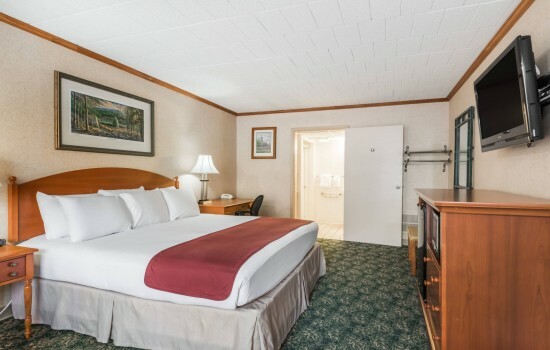 This non-smoking guest room comfortably accommodates up to four guests and includes a sitting area, microwave, and refrigerator, a coffee maker, complimentary WiFi, a flat-screen TV, and premium cable channels. Additional conveniences include personal climate control, an iron and ironing board, and a newspaper. The private bathroom is fitted with soft towels, a hair dryer, and complimentary signature toiletries. 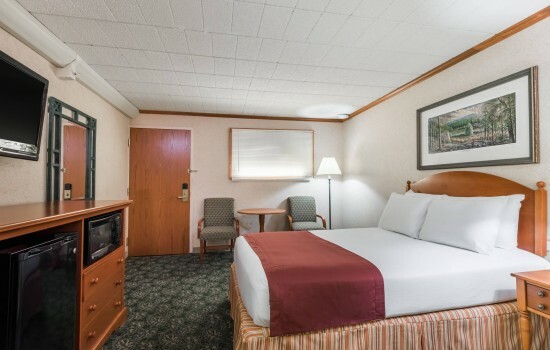 Our accessible king room is ideal for guests looking for mobility features and comfortably accommodates up to two guests. This non-smoking room features wheelchair accessibility throughout the room and an amplifier/TDD for the phone. Additional comforts include a microwave, and refrigerator, a coffee maker, complimentary WiFi, a flat-screen TV, and premium cable channels. Additional conveniences include personal climate control, an iron and ironing board, and a newspaper. The private bathroom is fitted with stability bars, a raised toilet seat with stability bars, soft towels, and complimentary signature toiletries. 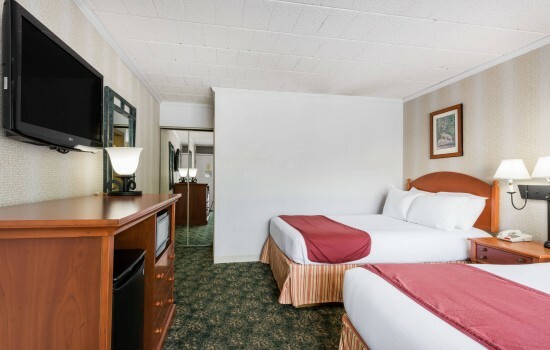 Our non-smoking king room comfortably accommodates up to two guests and includes a microwave and refrigerator, a coffee maker, complimentary WiFi, a flat-screen TV, and premium cable channels. Additional conveniences include personal climate control, an iron and ironing board, and a newspaper. The private bathroom is fitted with soft towels, a hair dryer, and complimentary signature toiletries. 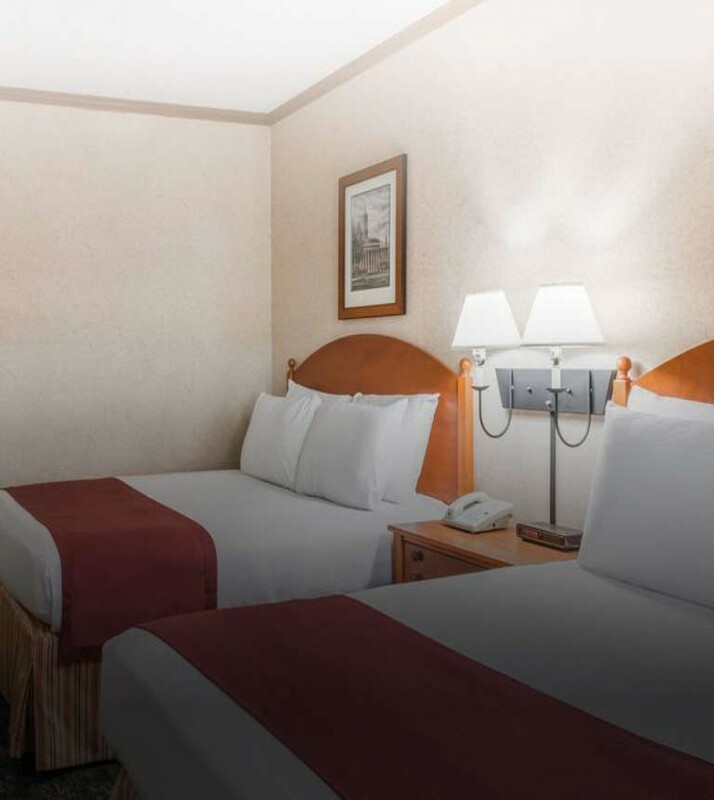 Our non-smoking two-room king suite is equipped with one king bed in a private bedroom with an adjoining full bathroom and jetted tub. There is a living room that is complete with a sofa and sitting area, and a kitchenette with kitchen supplies, a coffee maker, and an adjacent half bath. 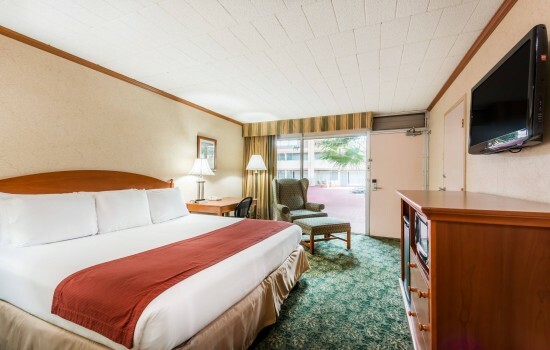 Additional conveniences include complimentary WiFi, a flat-screen TV, and premium cable channels, personal climate control, an iron and ironing board, and a newspaper. The private bathroom is fitted with soft towels, a hair dryer, and complimentary signature toiletries.